Hey everyone, welcome back to “Alex’s Foreign Foray”. As I said last week, we’re trying something a little different for the next couple of weeks. 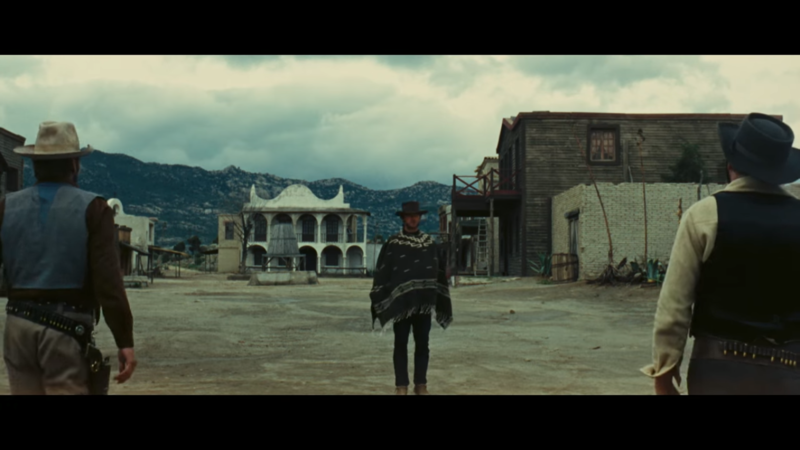 We’re looking at the “Dollars Trilogy” by Sergio Leone, with today’s segment being the first film, A Fistful of Dollars, from 1964. If you’re new to the series, you can find out what it’s all about here. Like I said, the next few weeks will be a mini-series of sorts, where we look at the “Dollars Trilogy.” I’ve actually seen today’s film long ago, but I can’t remember anything about it, so it’ll be interesting to watch all three films over the next few weeks and see the similarities and consistencies. If it goes well, we might even throw in an encore week of Duck, You Sucker! So, our journey continues this week as we move from Spain to Italy, where we’ll remain for a few weeks. 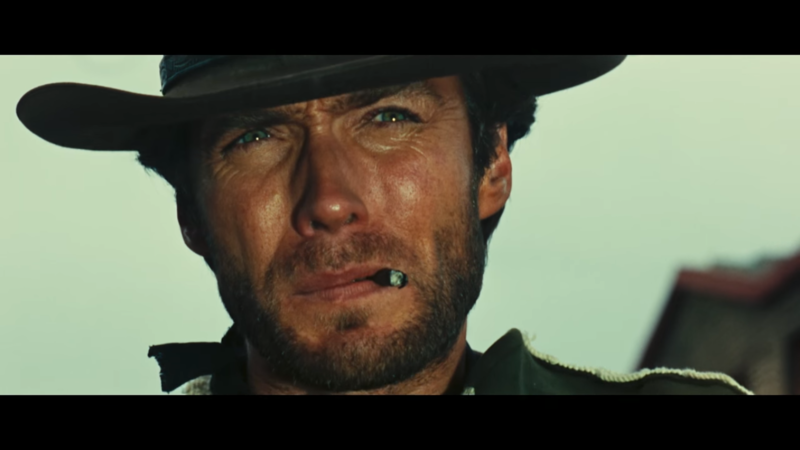 The first part of Sergio Leone’s “Dollars Trilogy” is A Fistful of Dollars. Inspired by Akira Kurosawa’s “Yojimbo” (which we’ll be looking at later in the series), The Man With No Name (Clint Eastwood) arrives in a border town where two rival bands of smugglers are terrorizing citizens, so he decides to pit the two bands against each other. I’ve always been infatuated with the western genre. Granted, I’ve only really seen a handful of “true” western films and also played Red Dead Redemption. I’ve always loved the themes and characters they have. When I started this series, I knew that I wanted to do this mini-series the second I got to Italy. The Man With No Name is actually referred to as “Joe” a couple of times throughout the movie, so when I talk about Joe that’s who I’m referring to. The first instance I noticed of this was when the coffin maker said he had the four bodies loaded. Interesting, as Joe could still, in fact, have no name, but is being called that as a sort-of “Regular Joe” kinda thing. What struck me pretty early on in the film is how good Leone is at staging the actors in scenes where everyone is talking (mild spoilers, though it’s early on). When Ramón is talking with everyone at the dinner table, Leone moves the camera around in an unbroken shot as Ramón speaks. All of the actors are in view clearly when intended: even if one is positioned behind two others, his face is in between shoulders so you can still see him. When Ramón’s words get slightly less welcoming, the camera tracks so he and his gang’s faces are all totally visible, shoving Joe and our “good guys” out of frame. The camera only cuts when Joe intervenes, and it cuts to a close-up of Joe. Reverse shot with Ramón. They’re at odds. 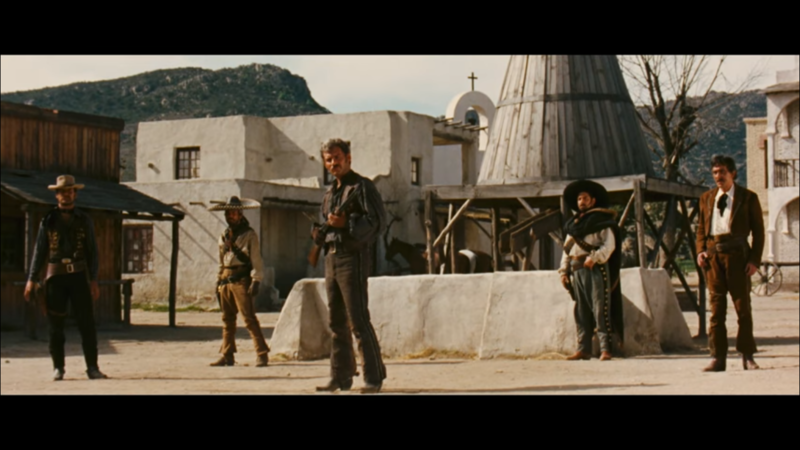 I think that Leone’s use of staging, long shots and cuts in this scene show why he’s inspired so many of today’s popular directors, and that’s just a standard talking scene early on in the film. Alright, well that was super specific. 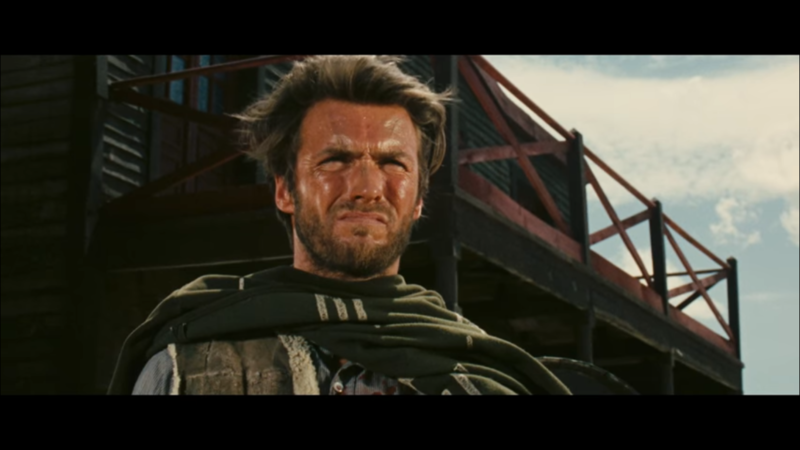 Generally, A Fistful of Dollars is a great film that was constantly entertaining. Ennio Morricone’s score is not my favourite work of his, but it is excellent nonetheless. It provides the right backdrop for the feel and tone of both the movie and the character. The cinematography does the same thing, with sweeping shots and cuts being used at the appropriate times. There is excellent lighting and staging that sets the right scene and makes it easy to believe in this western world. 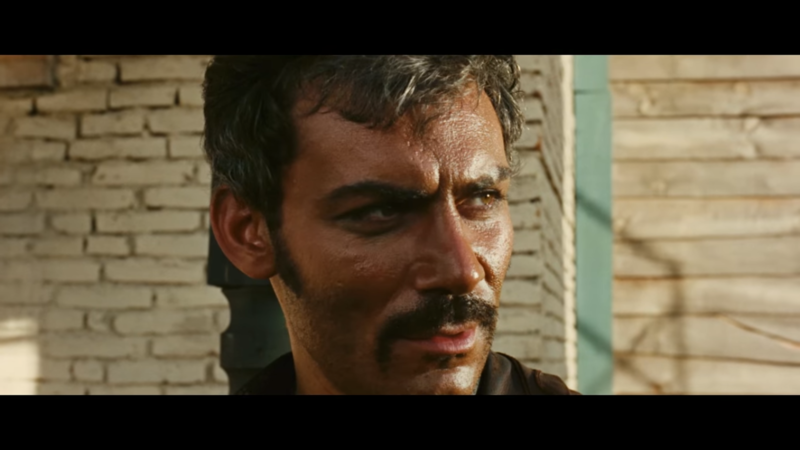 Seeing the film through this lens is intoxicating, as Leone breathes life into the film through the frame. 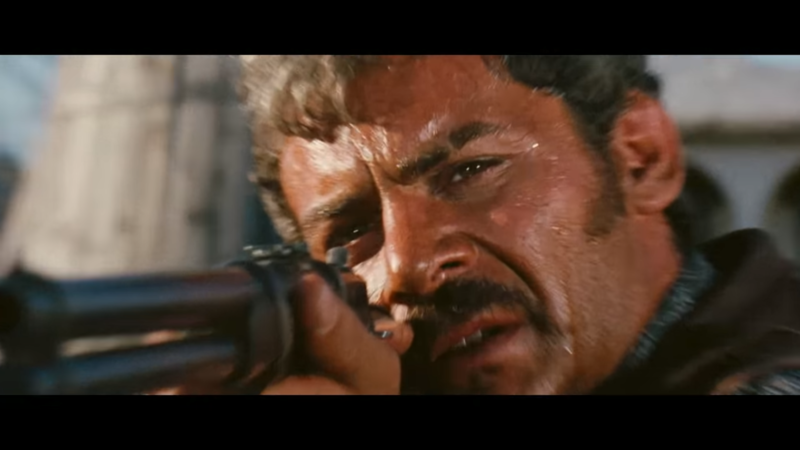 Close-up shots of eyes almost allow us to look into the souls and motivations of our characters, especially during the gunfights, where we see the panic in some characters eyes, and the stone-cold determination of Joe. Speaking of which, Joe is the perfect interpretation of the classic western gunslinger. Suave, calm, and methodical, it’s a joy to watch his plan play out. His outfit is bitchin’ and his demeanour is full of the utmost level of swagger that it makes me feel cool for just watching it (“my mistake… four coffins”). The gunfights are pretty good, too, especially the final one. Also, that’s where Marty gets the idea in Back to the Future Part III! The only thing I found odd was the dubbing. I’m assuming this is the only version available because there wasn’t an Italian option on the Blu-ray disc. With the exception of Eastwood, all the actors speak Italian with the words dubbed over in English (Eastwood speaks pure English). It’s a little jarring at times but once I got used to it, it was alright. I’m interested to see how this film stacks up to the other two in the trilogy and to Yojimbo. To see that you’ll have to check back in the coming weeks. 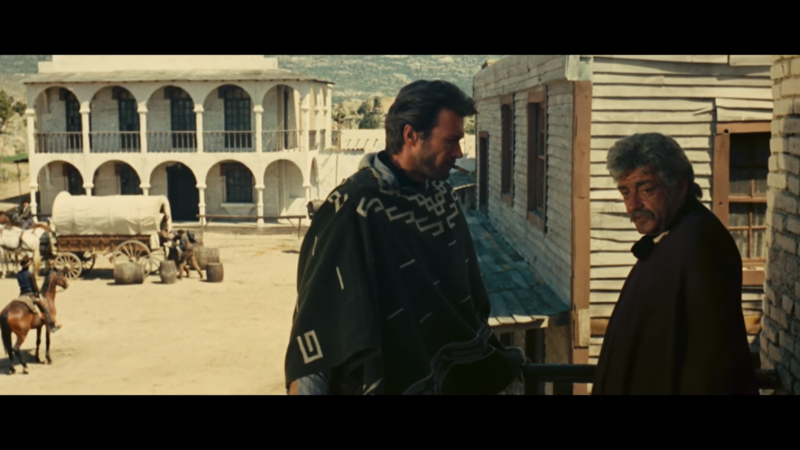 Overall, it’s a little light this week because it’s the first part of this trilogy of reviews and I have nothing to compare it to so far, but A Fistful of Dollars was excellent. It was cool to see a lot of elements and beats that obviously inspired future films (and maybe Yojimbo inspired those too, I don’t know). The whole trilogy is available for a decent price on Blu-ray. NEXT WEEK: We look at For a Few Dollars More, the second film in the “Dollars Trilogy” as we remain in Italy for another week. Student and lover of all things cinema. 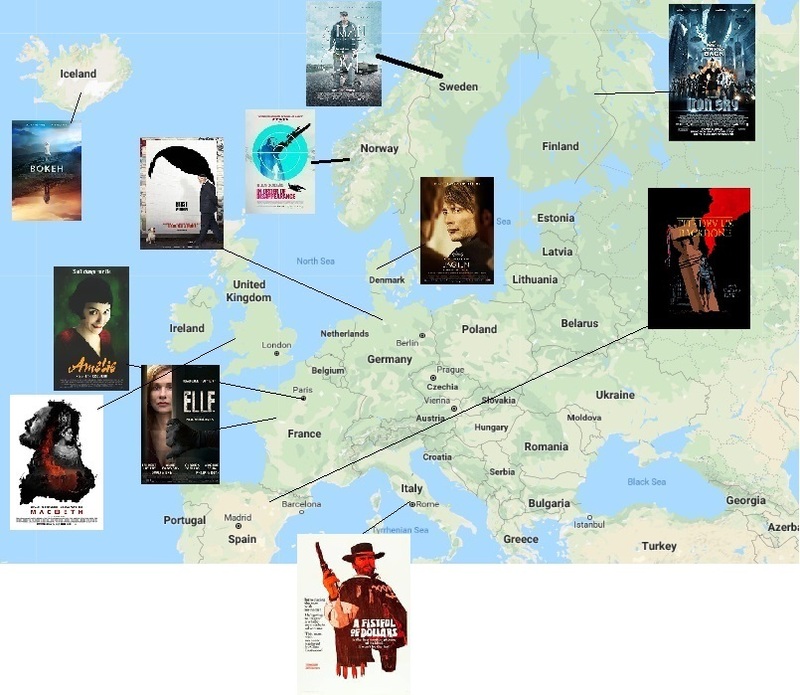 Favourite genres include sci-fi, thriller, and adventure, but is open to nearly every genre. Lover of good movies, television, and games, and sometimes sits through bad ones too. Nerdwest Podcast – Power Rangers, John Wick 2, and more!